A blog covering the Pittsburgh Pirates from top to bottom. The title of this article is slightly misleading. It's very rare for a best case scenario to actually happen. A better scenario can always be imagined. Therefore, the Pirates pitching prospects could have technically done better this year, but realistically it's hard to imagine a better overall season for the pitching strength of the Pirates farm system as a whole. In fact, elation is probably the best word to describe the appropriate reaction of Pirates fans. Below is a short description of all the pitchers who have a very good year for the Pirates, based loosely starting at the top on how they are viewed as a prospect currently. Over the past several years, the Pirates farm system has steadily improved under the watch of general manager Neal Huntington. 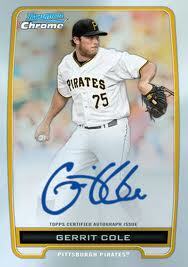 At the moment, prior to the official graduation of Gerrit Cole, it may be at its zenith. The farm system is absolutely loaded with both pitching and hitting prospects. For fun, I decided to break the farm system into two systems, one consisting of just pitchers and the other of hitters. From there, I'll compare each Pirates farm system to farm systems league-wide, identifying those that that one or both of the Pirates farm systems are clearly stronger than. This will show how incredible the Pirates farm system currently is and how balanced it is as well. Indianapolis played a double header. The Indians won both games against Norfolk by scores of 8-1 and 5-3. In the first game, Jeanmar Gomez pitched a gem in a rehab start. He threw 5 innings, giving up no hits and no earned runs. Gomez walked 1 and struck out 4. Andy Oliver started the second game, giving up 4 hits, 3 earned runs, and 7 walks in 4.2 innings. He did strike out 7 batters as well. On offense, Tony Sanchez went 2-4 with a double. Andrew Lambo went 4-8 with 2 homeruns, a double, and a strikeout. Ivan DeJesus went 3-8 with a double. Next game: 12:00 P.M., 6/20. Indianapolis DNP - Rain postponement; The Indians will play a doubleheader on 6/19, with Jeanmar Gomez slated to start the first game and Andy Oliver the second game. Indianapolis beat Norfolk 4-2. Stolmy Pimentel made his first AAA start and pitched very well. He pitched 6 innings, giving up 5 hits, an unearned run and 2 walks. In addition, Pimentel punched out 7 batters. On offense, Matt Hague went 3-4, with a run scored and an RBI. Tony Sanchez continued his impressive season, going 2-4 with a 2B and a homerun. He also scored a run and knocked in two. Ivan DeJesus also had two hits, one run scored, and one RBI, hitting a homerun along with a single. Jean Gomez will pitch against Norfolk on 6/18 at 7:05 PM. The Indianapolis Indians dropped their game against the Durham Bulls by the score of 5-2. James McDonald took the mound on a rehab start and gave up 8 hits, 3 earned runs, and issued 3 walks, while only striking out 1 batter in 5 innings. He threw 93 pitches and only 52 for strikes. Josh Harrison led off for the Indians and went 2-4 with a triple and a strikeout. Tony Sanchez went 1-4 with a run scored. Newly promoted Andrew Lambo went 1-3, with a 2-run homerun. Stolmy Pimentel will make his AAA debut on 6/17 at 7:05 PM. Gerrit Cole: Where are the Strikeouts? Through 12IP, Gerrit Cole has only recorded three outs via punchout. Considering the confirmed importance of strikeouts - batters who never put a ball in play only reach base in the most rare of circumstances - this could be alarming considering the expectations surrounding Cole. The former first overall pick is supposed to come into his own quickly and anchor the Pirates as the best starter to pitch in the steel city in decades, if not possibly ever. A scouting reports suggests Cole could meet these expectations. His stuff is tremendous and he pitched well in 2012, but in 2013 Cole's numbers in AAA were less than inspiring. To date in AAA this year, Cole had only struck out 47 batters in 68 innings compared to 28 walks prior to being called up.